What do sane people do after the Boston Marathon? They rest and get themselves ready for the summer season of course. But one of the things I wanted to do this year is find races I have never done before. give you my review of the race and festivities surrounding it. I decided that I would drive the two hours up to Canton bright and early on Sunday morning instead of staying all night. I woke up at 3:45, packed my car with all the things I wanted to eat before the race and a change of clothes for after the race and headed out to Canton. I arrived in Canton at 6am, plenty of time to get myself ready for the race or so I thought. I followed directions to park on the fairgrounds and thus began a day of more ups and downs that I had on the hills at Boston two weeks prior. The marathon had changed the venue and finish line from years prior. Normally the marathon ended in the Canton Hall of Fame football stadium. It was one of the reasons I took the bib so I was saddened to hear that wouldn’t be happening this year (the stadium is under construction). Instead, the race started and ended in downtown Canton. The race director informed me that the race had grown from around 1500 participants last year in the full and half marathon to over 5000 this year. That was obvious in the mess that was the parking situation. All runners were directed to park at the fairgrounds but only one entrance was open with traffic coming down a tiny two lane road. I sat in traffic for 45 minutes to drive .2 miles to park my car. The lack of planning to be able to accommodate this massive increase in participation was obvious here. There were several gates to the fairgrounds that were not open that could have helped alleviate the traffic mess. transported to the start line 26.2 miles away, it was obvious I wasn’t in Kansas Boston anymore. Thankfully on the bus ride over, another runner announced they had delayed the race start 15 minutes due to the massive traffic jam of people who couldn’t park and get to the start line. somewhere around 1:25 which would be hard on 13 days post Boston Marathon legs, and the humidity was near 100% and it was 60 degrees. definitely not going to let me go as fast as I wanted to go, but I decided I would just go as fast as they would let me as long as they would let me. Around mile 3, we passed the Football Hall of Fame. I had never seen it before and it is a very cool looking building. Mile 4 passed and that was the last time I stayed on the pace I had planned. I just decided to enjoy the course and try to finish under 1:30. Mile 5 had the first of many rolling hills the course offered. Normally, these wouldn’t be that bad but my quads were still beat up. Miles 10 and 11 had the highest points on the course and then route goes downhill and returns you to the start line. If you are running the full marathon, you went back out the exact same route in reverse. The course was well stocked with water and Gatorade every two miles. There were also two energy gel stations at miles 8 and 18. The start line was like many races I have run where you have the big inflatable finish line with a couple clocks posting finish times. I finished in 1:29:26 (slower than my half split time in my fall marathon!) and was immediately given a very cool medal. 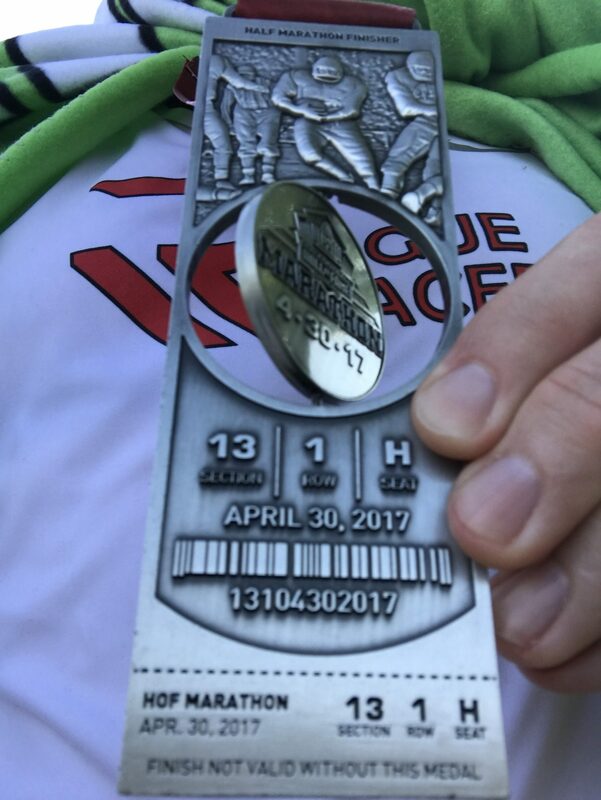 The medal resembled a ticket to a football game. It is definitely one of the coolest medals I have ever had at any race. Another great thing, right after you finish, you are given a nice fleece Hall of Fame football blanket. I was directed to a tent where there would be food and snacks. The tent was well stocked with potato chips and plenty of other things as well. There was also water and an off-brand energy drink I had not heard of before. They also had grilled hot dogs which was nice. I hung around the finish line for a while to cheer other racers on and then went to check on my results. Apparently I was third fourth in my age group (just found out that has been changed to 4th) and there would be awards but no one had a clue where those were and when they would be presented. I ended up talking with some other runners and after hanging around the finish area for over an hour, I figured I would just come back later for the award. 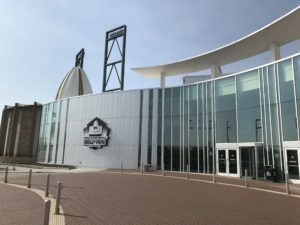 I was going to enjoy one of the best parts of the race, all runners were granted free entry in to the Football Hall of Fame with their bib ($25 savings) along with free transportation to and from the HOF. I took the courtesy bus over to the HOF and toured a little quicker than I would have liked to because I still needed to drive home. The HOF was nice and it was more interesting than I thought it was going to be, especially the early history of the NFL. Then I went back outside to catch the courtesy bus that was supposed to pick me up and drive me to my car or back to the finish line. I was going to go back and pick up my age group award. And then I waited. And waited. Twenty minutes, forty minutes, finally a bus arrived and they said they were full. I found a number for the race director online and called to see if there were any buses coming back. They said they would get one over there. Then more waiting. Finally after waiting well over an hour, I decided to walk 2.5 miles back to my car and I didn’t even bother going back for my age group award. All in all there were a lot of things I liked about this race. The swag was awesome. The blanket, free ticket to the HOF and an awesome medal. But the negatives left a sour taste in my mouth. The parking situation stressed me out in the morning, and then not being able to catch a transport back to my car was ridiculous. I probably will not do this race again because of those things and usually if I am running a half, I am trying to PR. There were too many rolling hills to PR this course for my taste. 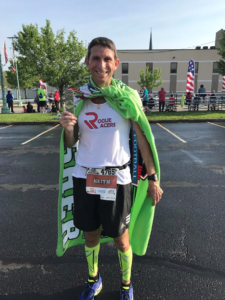 Next Rogue Racer of the Week – Brian K.
Rogue of the Week – Brian C.